Dining Out: Chavat Vadhan | Pop.Bop.Shop. As some of you may remember, I spent 10 days in May on a trip to Israel. I have been many times, but before last month, my most recent visit had been in February 2010. This trip I split my time between one of my closest friends and with my aunt, uncle and cousins. On the day I arrived my friend, her husband and their adorable two year old son came to pick me up at the airport - welcome poster and everything! I landed around 11:45am Israel time (they are seven hours ahead) and we had about an hour and forty five minute drive south to their house in the city of Be'er Sheva. 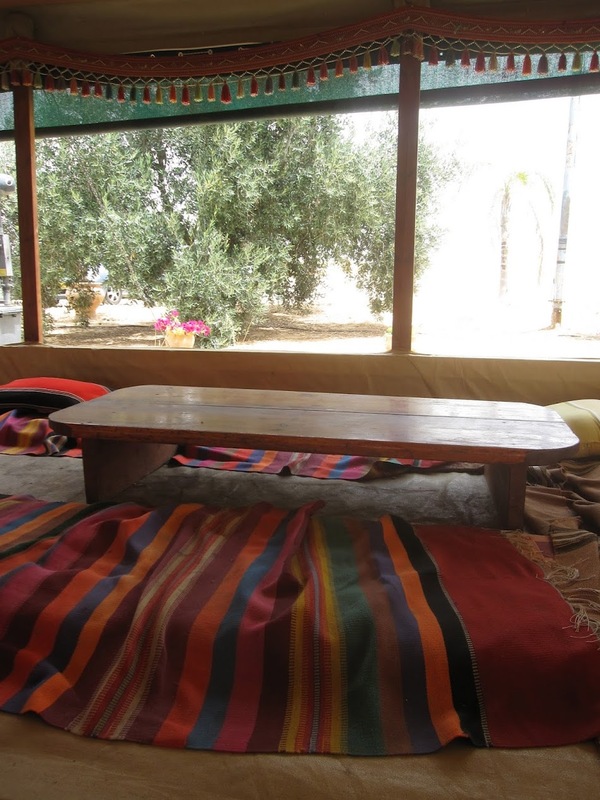 Along the way they took me to lunch at Chavat Vadhan, a Bedouin tent. For anyone who has been on a tourist trip to Israel (Birthright people, I'm talking to you), then you have had this exact experience. It's so Israel. Here is the view from the entrance to the tent. All of the tables are low to the ground and along the perimeter of the tent. You sit on the ground while you eat. The tent had great views of the desert around us. At the entrance to the tent is a small counter where you place your order. We ordered pita with labane cheese. They warm the pita on these giant, round slabs of coal and they spread the cheese right on there, heating it as it hits the pita. For our meal we ordered the pita (one for each of us), green olives and malabi. Here is my pita, neatly folded and stuffed with labane. These olives are extra salty and so delicious. The malabi, inhaled by their two year old, is a milk pudding. Traditionally it's made with rice flour. It tastes like really sweet breakfast yogurt. 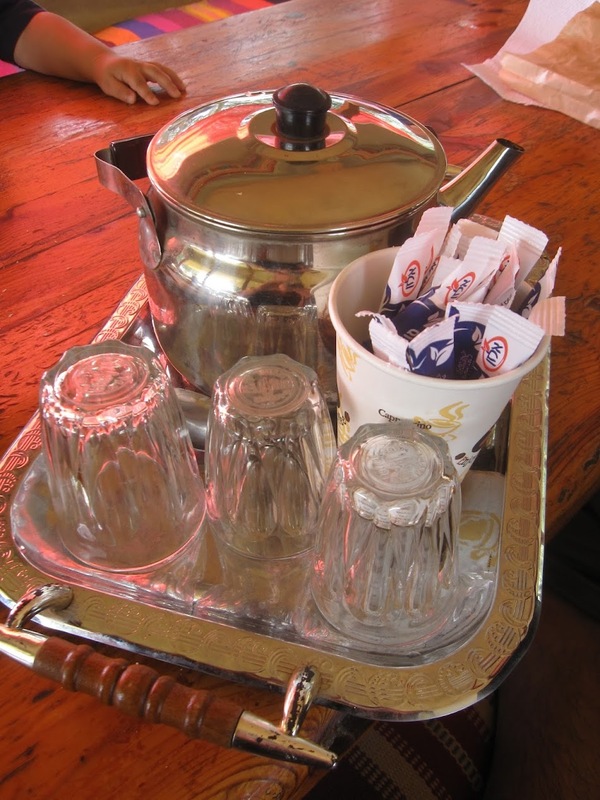 Half way through our lunch we decided to order a pot of rose water tea. Most people sweeten the tea with sugar, but I liked it plain. This prompted my friend's husband to ask, "What? Were you Persian in a past life?" Apparently it agrees with me! 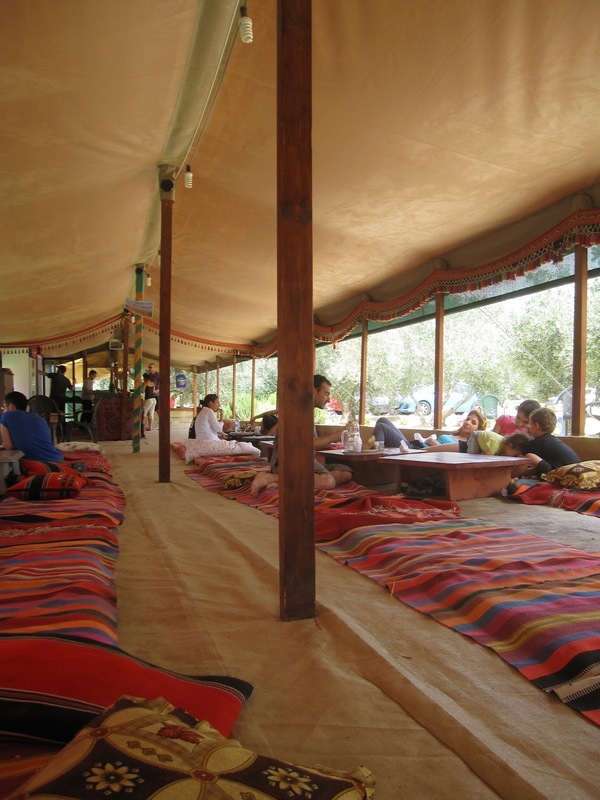 After we finished our pita, olives and rose water tea we just sat in the tent and relaxed. There was a nice breeze and even though we were in the shade, I could still feel the sun. I could have easily spent all afternoon there. It was the perfect way to settle into full on vacation mode. If you live in Israel or are planning a trip, you can visit Chavat Vadhan by taking Highway 40 (from the North). The tent is right before the Bedouin town of Rahat. 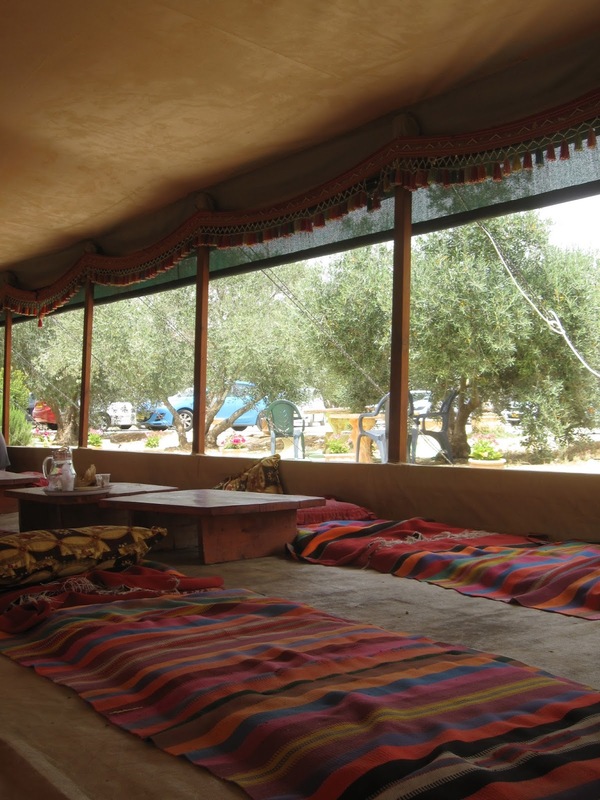 Have you ever eaten in a Bedouin tent? Tonight I went with a friend to the Melting Pot to celebrate the holiday season and exchange gifts! She had never been before and I was thrilled to accompany her on her first trip! This was my fourth visit and I am breaking a Pop.Bop.Shop. record by writing about the same place for a third time! You can check out my previous two posts here and here. What can I say, I just love it! I have just returned from a long weekend in Sin City. Las Vegas is one of my favorite vacation destinations. In general, I love that absolutely everything there is so over the top. More specifically, I keep going back because it is sunny 365 days of the year, every hotel has a beautiful pool, the best chefs in the world seek out these hotels for their restaurants and whatever your interest is, there is an entertainment option for you (concert, comedy performance, Cirque du Soleil show). And did I mention the luxury shopping malls?